EBONY reports that RNC Chairman Reince Priebus continues to push the Republican Party’s minority outreach efforts with an address at the National Urban League this week. 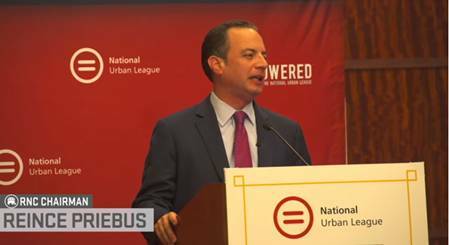 Earlier this week, Republican National Committee Chairman Reince Priebus spoke at the 2015 National Urban League Conference in Ft. Lauderdale, Florida. Priebus addressed the organization's leadership during the “Save Our Cities: Education, Jobs, Justice” Leadership Luncheon and discussed the RNC’s ongoing efforts to engage Black voters, including the #CommittedToCommunity: Engage, Empower, Uplift campaign. “For too long, some have peddled the idea that only one party cares about communities of color. And for too long, we’ve let that charge go unanswered,” Priebus said. “I’m here to tell you today, we’re doing our part. We’re working. We’re mobilizing people, engaging with voters, and answering the call.” Read more HERE. I guess it really is true that weak people take strong positons on weak issues. Raynard Jackson & Associates, LLC is an internationally recognized political consulting, government affairs, and PR firm based in Washington, DC. Jackson is an internationally recognized radio talk show host and TV commentator. He has coined the phrase “straticist.” As a straticist, he has merged strategic planning with public relations. 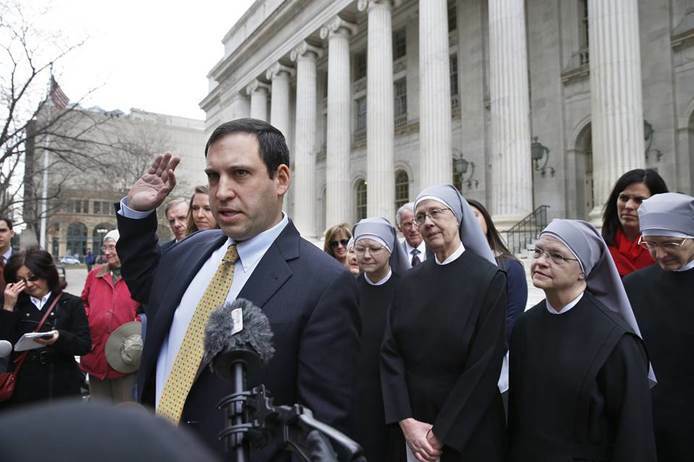 The Tenth Circuit forces nuns to obey the contraception mandate. These are inauspicious times for religious liberty, and this week’s illustration is the appeals court decision on Tuesday that instructs an order of Catholic nuns to comply with ObamaCare’s birth-control mandate. A 2-1 majority of a Tenth Circuit Court of Appeals panel informs these believers that their moral convictions are wrong on the merits, so shut up and submit. The Little Sisters of the Poor run nursing homes and hospices and object to their health plan providing contraception including abortifacients. They’re challenging the so-called accommodation afforded in 2012 to religious nonprofits like parochial schools and soup kitchens. Typical of the Obama Administration’s bullying conception of religious freedom, the Little Sisters conclude that the form they must sign to get a supposed exemption from the mandate implicates them in a grave sin. That’s because their health plan is self-insured, meaning that they use an insurer as a third-party administrator and pay claims directly through a trust. When the Little Sisters join the opt-out contract, their insurer is then obligated to cover birth control for “free” that would not otherwise be provided but for the opt out. The reality of the accommodation’s accounting fiction is also that the Little Sisters must ultimately settle the bills for the drugs that are supplied in their name. If they refuse to sign the opt out, each of their homes must pay penalties of roughly $2.5 million a year. The nuns claim this coercion violates the Religious Freedom Restoration Act, or RFRA, which says that when the government substantially burdens the free exercise of religion, it must use the least restrictive means to do so. Au contraire, assert Judges Scott Matheson and Monroe McKay: “Although plaintiffs allege the administrative tasks required to opt out of the mandate make them complicit in the overall delivery scheme, opting out instead relieves them from complicity.” So there. In other words, the Little Sisters believe they are commissioning a moral transgression. The Tenth Circuit is telling them, no, the opt out is “unremarkable.” Yet standard judicial practice is to refrain from reaching unresolvable questions of theology or ethics, and RFRA was written to give the benefit of the doubt to the faithful. As Judge Bobby Ray Baldock comments in his dissent, “the accommodation scheme foists upon the self-insured plaintiffs a choice with dire consequences” in violation of RFRA. A less restrictive method could be federal birth-control vouchers, rather than conscripting the health insurance of religiously affiliated institutions. This case is destined for the Supreme Court, which has stayed the Little Sisters mandate pending appeal. But the spectacle of the Administration attempting to crush the conscience of a religious order is a lasting discredit to the U.S. traditions of pluralism and tolerance. If you care about your child's education, or the freedom to worship as you see fit, or the emotional and financial toll of mass incarceration, then you should care about how the political parties are addressing these issues. If you own or want to start a small business, seek an opportunity that will equip you with the tools to get from a low-paying job to a better one, or are frustrated by the taxes eating away at your piece of the American Dream, you should care whether the candidate you vote for will make matters better or worse. For too long, some have peddled the idea that only one party cares about the social ills and racial disparities that are still too prevalent in society today. Not true. But for too long, Republicans have stood by and let the charge stand unchallenged. Not anymore. Rich, poor or middle class, we know that the most pressing and persistent problems that matter to black Americans today are “education, jobs, and justice,” in the words of the National Urban League’s 2015 “State of Black America” report. In Washington and across the country, the Republican Party has real solutions to these very real problems—not just in theory but in practice. And here's why we think starting with less government means more for everyday wage earners, families and institutions of faith. Start with education. America’s education system faces a crisis. We’re slipping behind in the world. But if you’re a black child in America, you likely face even greater challenges. The reality is, there are yawning achievement gaps between black students and white students. This is in no small part due to black students’ confinement to underperforming schools. And that’s why Republicans are such advocates for school choice, the simple yet powerful idea that all parents should have the freedom to choose a good school for their children. Scholarships, like the DC Opportunity Scholarship or similar ones in a number of states, help parents afford a private school when their public school doesn’t meet their needs. Republicans have also expanded cost-free educational options through public charter schools and even virtual schools. And while Democrats have stripped funding from Historically Black Colleges and Universities (HBCUs), Republicans continue to advocate for the preservation of the very institutions that are equipping new generations of Frederick Douglasses and Mary McLeod Bethunes. On the jobs front, Republican governors have gone to great lengths to break down the barriers to job creation and to help workers acquire the skills needed for today’s jobs. On the federal level, Senator Tim Scott, for example, has an Opportunity Agenda, addressing both education and job training needs. Many of the proposals of his SKILLS Act were incorporated into a bipartisan job training bill, which the president signed last year. Other components of his agenda focus on energy jobs and expanding apprenticeship opportunities. Finally, the issue of justice, one whose urgency seems to grow every day. From Senator Rob Portman’s Second Chance Act improving prisoner reentry to efforts by Republican congressmen to strengthen the Voting Rights Act, Republicans in Congress are working to expand freedom and ensure justice. At the state level, Republicans have led the way on sentencing reform, gaining bipartisan support for programs from Texas to Georgia to New Jersey that focus on rehabilitation, rather than punishment, for non-violent offenders. To address the rising concerns of injustice at the hands of law enforcement, Republican Senators have stepped up to hold federal hearings on the use of body cameras and other urgently needed reforms. Of course, education and jobs are themselves issues of justice, and Republicans have prioritized them accordingly. These are facts that you may not hear about often or ever, but the work continues as we strive to earn the trust of every voter. That's why we're actively engaging in states like Ohio and cities like Columbus, Cleveland and Cincinnati. 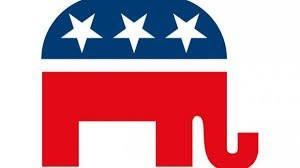 In addition to our presence for the first, upcoming GOP presidential debate in Cleveland, expect to see RNC staff in your community, discussing our shared values and actively recruiting people from across the state. You will hear from us often and in media outlets like this one to share our message, mobilize new activists and ask for your vote. With a presidential election process already underway, candidates for the Republican nomination will have an opportunity to outline the ways their specific policies would create more opportunity for black America—and actually address the chronic economic, health, education and social disparities. Despite all this, some say that Republicans shouldn’t bother engaging with the black community. It’s a lost cause, they say, pointing to single-digit support in previous presidential elections. We disagree. We know when we engage, we win, and moreover black America wins. Just last November, in Ohio, one in four black men voted for your Republican governor. They voted their values. This kind of voter engagement can make a big difference. And given the opportunity to make the choice, black voters can help us open doors that expand opportunity for all. As Chairman, I have made this a priority because no voter should be overlooked, and no voter should be taken for granted. Just as the Urban League says of their own well-respected report, “We don’t have all the answers.” But Republicans are working hard to address the most pressing concerns of the day, and we are eager to find common ground wherever we can. Capitalism has a new competitor and its name is "shame." The left is determined to make capitalism morally reprehensible. Cloaked in provocative terms like "income inequality," wealth redistribution has become the popular economic philosophy in America today, but it doesn't hold a candle to capitalism. When your first grade teacher asked the class "what do you want to be when you get big?" 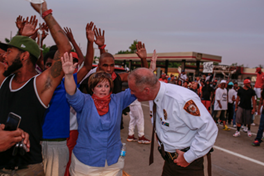 I'm doubtful anyone raised their hand to say "ooh, ooh, a welfare recipient!" I'm also certain your classmates never pointed to posters of their teen idols to say "anyone but them!" In other words, socialism isn't natural; no one grows up with aspirations of government dependency--unless you live in Greece! Socialists intentionally suppress creativity and innovation by discouraging individual God-given talent and encouraging dependency. In short, your failure is required for its success! Atheists Karl Marx and Frederick Engels believed that religion was the anti-depressant for the oppressed working class. Engels, in particular, believed that when society adopted socialism the economic chains of the working class would be eliminated, thereby eliminating the need for religion altogether. At the root of socialist philosophy is the demand that you forfeit your faith, and the dreams God birthed in you. Additionally, socialists would like you to believe that without coercion, individuals are incapable or unwilling to be generous to their neighbor with their own hard earned money. It's just not true! What is true, however, is that thievery via over-taxation has never incentivized productivity. 1.) Capitalism allows you to fulfill your God given purpose: Our intelligent designer has inspired our dreams and purpose. Government can't produce your dreams, but they can take them away by creating an atmosphere that undermines our faith in God and the abilities He's equipped us with. When God is banished from society, government acts as our moral authority and by extension an arbiter of our dreams. The only work that matters to the government is that which is needed to sustain it. Individuality and imagination threaten the status quo of socialism. Capitalism allows man's purpose to flourish by exposing our strengths and weaknesses in the marketplace. 2.) Capitalism provides for your family: The Bible instructs us to leave an inheritance to our "children's children." The Left's "War on Poverty" is a perfect example of how socialism destroys the family by disincentivizing work. The black American family particularly has suffered greatly under the hand of government benevolence, going from a marriage rate of over 70 percent pre- War on Poverty , to an out-of-wedlock birth rate of over 70 percent in just two generations. When the Bible says "if a man doesn't work he shall not eat," but our entitlements train our citizens that you don't have to work to eat, we're witnessing the beginning of the end of this once exceptional nation. 3.) Capitalism buys you cool stuff: Can we stop acting like self-righteous phonies! We all go to work hoping to better our position in life. The coolest thing about making money is the joy of spending it and building wealth. When our priorities are in order, we should feel guiltless for rewarding ourselves. Immigrants all over the world flock to America to accomplish what we take for granted-- the American Dream. God blessed Abraham and Joseph beyond belief as a result of their faithfulness to him. If He isn't ashamed of blessing those who work hard with wealth, neither should we be. 4.) Capitalism helps you bless others: Socialism is dependent upon capitalism. Non-profit organizations must depend on for-profit organizations and their employees to thrive. Consider when you buy a car, the maker, salesman, mechanic, tire specialist and gas attendant will keep their jobs. When my pastor takes up a mission or benevolence offering, the poor, widow and orphan will be blessed. If a family member is living paycheck- to-paycheck, the best help and coach for restoring their finances and coaching them to prosperity and out of the welfare line is you, not Uncle Sam. You are uniquely qualified to be you. In America "income inequality" is a state of mind. If we all take the time to invest in our own interest, dreams and gifts, perhaps there would be fewer "rich people haters" and more of us getting rich. To the “Black Lives Matter” crowd, it seems that most black lives don’t. Roughly 7,000 blacks are murdered each year — more than 90 percent by other blacks. To some Democrats, only those shot by white police officers or white bigots seem to matter. Just 25 percent of about 400 local police killings a year involve a white cop and a black victim, an FBI study found. 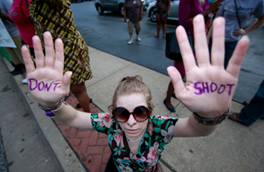 Shootings of blacks by police has been cut in half since 1981. For every black person killed by a white cop, black criminals murder 70. It is 25 times more likely a black person will commit a crime of violence against a white person than vice versa. There’s so much crime in inner-city black communities because they’re poor, some say. They have it backward. If poverty caused crime, crime rates wouldn’t fall during recessions; wouldn’t be much lower in poor rural counties than in cities, where incomes are higher. When crime rates are adjusted for “familial risk factors,” the correlation between poverty and crime all but disappears, Swedish researchers found. We’ve spent more on the “War on Poverty” than on all of America’s real wars combined. As social service spending exploded, urban decay accelerated. Crime causes poverty. Businesses flee violence-riddled neighborhoods, taking jobs with them. Property values fall. More than 60 percent of prison inmates — 85 percent of juveniles who interface with the juvenile court system — are functionally illiterate. Rotten schools stunt millions of black lives. 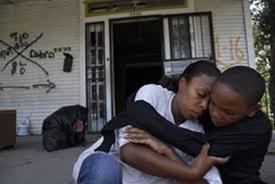 A reliable indicator of violent crime in a community is the proportion of fatherless families. About 80 percent of youths in prison grew up without a dad at home. Only 2 percent of poor teens who finish high school, get a job and get married before having children end up living in poverty as adults, the Brookings Institution found. The keys to fighting crime — and thus poverty — are to give kids access to a quality education, encourage mom and dad to get hitched and, especially, to protect the law abiding from criminals. Many Democrats prefer nostrums designed more to enrich themselves than to help the poor. Many inner-city schools stink because they’re run for the benefit of teachers and administrators. Votes and money from teacher unions matter more to a lot of Democrats than the lives of the children trapped in them. If so much of it weren’t spent on those who administer 126 federal programs, what we spend each year to “fight poverty” would be enough to lift every poor family in America out of poverty. If more had jobs, the poor wouldn’t need “help” from so many well-paid bureaucrats. And people dependent on the dole are more likely to vote Democratic. 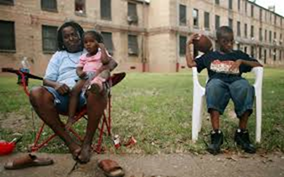 The root cause of black poverty is white racism, liberals say. Legal segregation ended in 1964 and was never a factor in most of our troubled cities, which were in much better shape half a century ago. The unemployment rate for black men is three times higher than in 1954. Black immigrants have had little difficulty climbing the economic ladder. The tragic consequences of what happens when we blame inner-city crime on “white racism” and the actions of police are vividly on display in Baltimore. City officials did little to protect the law abiding during the rioting that followed the death in police custody of drug dealer Freddie Gray. Murders are up 43 percent from this time last year — many of them occurring since the indictment of six police officers in connection with Mr. Gray’s death. Cops “are more afraid of going to jail for doing their jobs properly than they are of getting shot on duty,” said the president of the Baltimore chapter of the Fraternal Order of Police. The hottest circle of hell should be reserved for those who foment racial strife for political gain.